Hola!! I am back in England! I arrived home Thursday at 7:30pm and then left the house again at 8 after a last minute plan to go camping with all my friends – that is total dedication there, not only did I give up my first sleep back in my bed, but I also did it after a 4 hour flight and traded the comfiness and warmth for the cold hard ground (*sung like Taylor Swift). I did have a lot of fun though and it was fun to catch up with everyone! While away I managed to get two OOTD posts – not as many as I’d hoped but most of my outfits had already been featured on my blog, sad times. However, while away I hit a big milestone, I reached 500 followers!!! That is SO crazy and I want to thank everyone so much for following me and inspiring me to keep this blog going – I feel really proud of it and it’s such an achievment for me. I love you guys!! Finally, before the post just a quick mention to all the lovely ladies that did a guest post for me – thank you so much! It’s really appreciated and I hope you all enjoyed reading them as much as I did! I’m not much of a lippy girl – every kind of bright lipstick just looks awful on me, but I do want to get into wearing some colour on my lips a bit more. 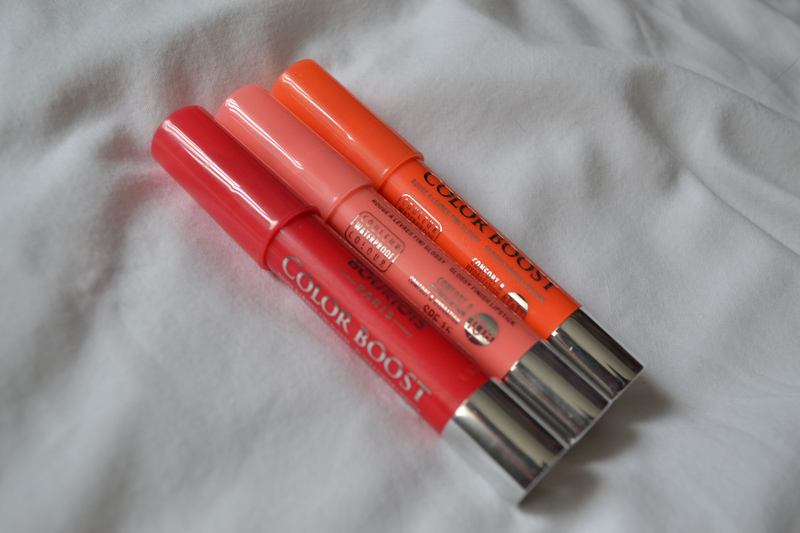 When I saw these Bourjous Colour Boosts circulating on the blogosphere, I knew I had to give them a go. They give a subtle colour as well as a gloss, without it all being too much of a statement. I picked up three colours: ‘Peach on the beach’ – the most subtle colour of them all giving a light pink tint, ‘Orange Punch’ – a lovely coral toned colour and ‘Red Sunshine’ – the darkest of the lot, being a dark pink, despite the title having red in it. I’m still not completely sure on how I feel about these, they’re similar to the Revlon Kissable Balm Stains and the Clinique Chubby Sticks, however I can’t judge on the products similarities and differences as I don’t own either of these. 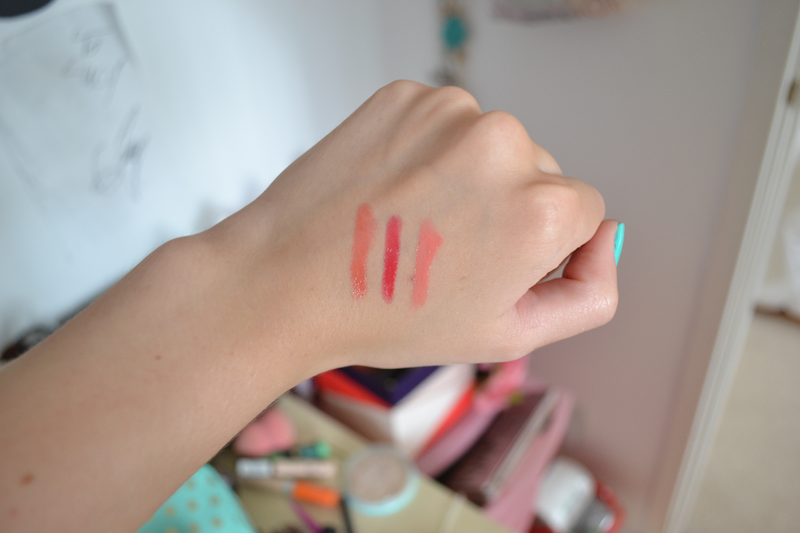 The colour of each of these transfers really well on the lips, as well as giving a high, glossy, shine. I’ve found that sometimes the colour – particually Red Sunshine can be a bit too strong for my liking, so just patting it with my finger makes it a bit more subtle aswell as matte. The product claims that it will last 10 hours on the lips which I’ve found to be wrong. The gloss fades within an hour or so and the colour lasts around 5 hours. Although, The waterproof claim is right. The product is very moisturising, unless you decided to pat it into the lips, I find a bit of vaseline over the top may me necessary, and they also have SPF 15 in which is always good! I’m still not 100% on how I feel about these, the colours are gorgeous but I just don’t feel like the lasting power is anywhere near as good as it claims, and I absolutely hate re-applying make-up in public, however they are good for me as I ease my way into wearing a bit more colour on my lips. "Autumn Anticipation – Guest Post Week – Day #6"